Is it really fall until you’ve had a slice of pumpkin pie? Tammye Bridgman, manager of Lockaway Storage on Babcock Road, doesn’t think so! Which is why she decided to show her customers a little appreciation by helping them ring in the fall season with two pumpkin pie days! 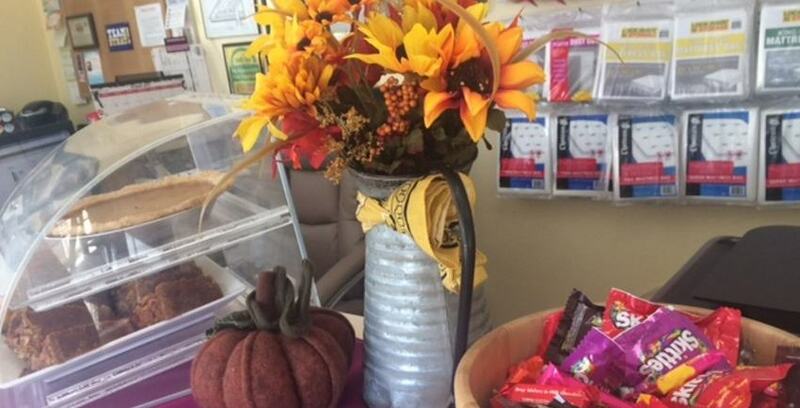 On October 29th and 30th, Tammye went all-out and baked multiple pumpkin pies and pumpkin bread for her customers. They were welcome to stop by, grab a slice, enjoy some beverages, and chat with Tammye. Not all of the customers who stopped by during the two-day event were fans of pumpkin pie, but Tammye hopes that they understood the message she was trying to convey. “This gave us an opportunity to pause and show people that they matter. It was great getting to see customers light up and appreciate the treats. Often times, people are rushing in to pay or asking questions and, with an event like this, you actually have to get their attention and tell them, ‘Hey! This is what we did for you. Would you like to take some pie home?’ Then you do get into really nice conversations and get to know your customers more,” Tammye said. If you haven’t caught on by now, Tammye loves to bake. Even though appreciating customers is at the heart of why this event happened, Tammye was more than willing to share her passion for baking with her customers. When asked if she had any tips for how she makes delicious pumpkin pies, Tammye shared three things that she felt made the biggest difference. Her first tip involved the filling. “The flavor of pumpkin stands out so much more if you take the time to cook it on the stove top. So take your can of pumpkin, heat it up with the sugar, and it just intensifies the pumpkin flavor,” Tammye said. Her second tip was a suggestion on spices. “I always add a little vanilla and use the best ingredients I can. Then I also add a little bit more cinnamon!” Tammye said. Her final tip focused on how to prepare your pie crust for optimal taste and texture. We’re so lucky to have such a passionate baker and facility manager at Lockaway Storage on Babcock Road and appreciate all that she does. This was Tammye’s last event for the year, but she says she’s planning more events for the coming year. Keep your eyes out for her future customer appreciation events at Lockaway Storage on Babcock Road! Happy New Year! Congratulations to our Holiday Contest Winner! Lockaway Storage on De Zavala Road Announces a Customer Appreciation Day! Thursday Night Lights commercial ! How Can Lockaway Storage Help You? *We’ve launched our new website! With our new site you will have greater access to your account information in a much more user friendly format. Unfortunately this will require you to create a new login with our system. We apologize for and understand the inconvenience and we appreciate your patience during our transition. All you will need to create your login is your unit number and gate code. If you have questions, please contact your facility manager directly. Please reach out to us at wecare@stratprop.com if you have any questions.